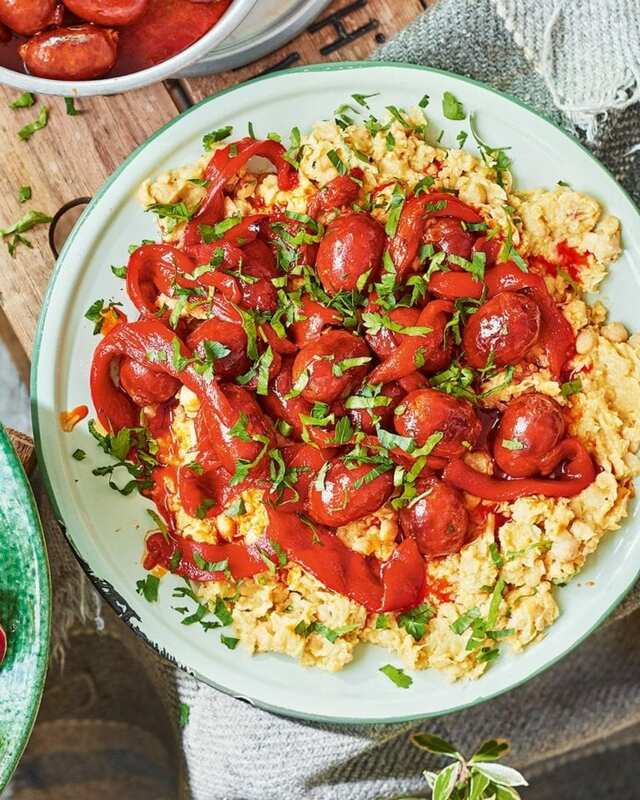 Chorizo sausage and peppers are cooked in sherry and brown sugar until caramelised, then served on a bed of lemony crushed chickpeas. This makes a tasty starter, especially when served with warm flatbreads. Heat the oven to 160°C/140°C fan/gas 3. For the chickpeas, wrap the garlic cloves in foil and roast for 15-20 minutes until soft. Heat the 1 tbsp oil in an ovenproof frying pan over a medium-high heat and fry the sausages for 5-7 minutes, turning, until coloured. Add the peppers, cook for 5 minutes more, then add the sherry and brown sugar and stir to dissolve. Bubble for 1 minute, transfer to the oven and cook for 25 minutes. Heat 3 tbsp of the extra-virgin olive oil in a pan over a medium heat. Add the chickpeas and cook for 2-3 minutes, then pour in 200ml water and bubble for 3-4 minutes. Mash the chickpeas roughly with the back of a fork, then stir in the remaining 3 tbsp oil. Mash in the roasted garlic, lemon zest and juice and lots of sea salt and black pepper to give a chunky, spoonable mash. Cool the chickpea mash and sausages to room temperature. Serve the chickpeas topped with the sausages and sherry sauce, sprinkled with parsley. Cool, then store the cooked chorizo and chickpeas in separate airtight containers in the fridge (or in a cool-bag). Keep the parsley in a separate food bag. This dish is best served at room temperature.